...HERSHEY. Gentlemen, and ladies: Now, when you take the kiddies to Hershey Park or the Museum--Or when you go on a couples retreat to the Hershey Spa & Resort--Or are looking to fill in the gap across an east-to-west Pennsylvania state-wide Pub Crawl--and are looking for good beer in Hershey, PA...come the end of next year ("Fall 2011" in their words), Tröegs will be right around the corner. The next chapter in the 15 year history of the brothers' brewery begins now. Well, that's because it had just popped in there within the past 30 minutes or so. 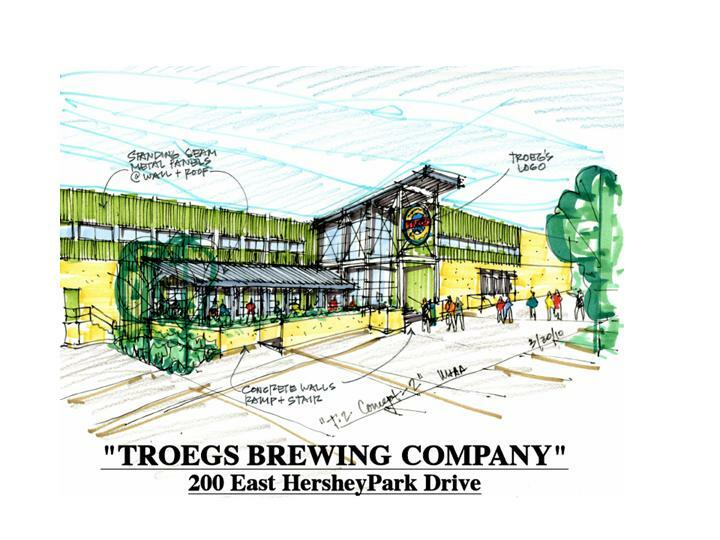 "Tröegs Brewery Announces Expansion..." read the title from Mr. Ed Yashinsky. Well, hot diggity that sounded like worthy news to me. Of course, the intrepid Bryson and Curtin (listed here alphabetically, of course) had already posted something up 'cuz that's their way. In addition to the new brewhouse, there will be a barrel-aging room and a tasting room (inside and out) to complete the "interactive" experience. See more below for details in their words straight from the press release. Exciting times for south central PA! Now, I'm off to TJs to celebrate with some Scratch 31 (Citra). HARRISBURG, PA — Chris and John Trogner, founders of Tröegs Brewing Company, announced today they have reached an agreement to open a new craft brewery in Hershey, Pennsylvania. Construction on the existing facility, located at 200 E. Hershey Park Drive, will begin immediately with a projected completion date of Fall 2011. "This is an exciting new chapter for Tröegs Brewery," said Chris Trogner. "When John and I started planning the brewery in 1995, we didn’t even know if we would ever make it to the actual brewing stage. Since opening in 1997, we have been fortunate to grow the Tröegs brand and increase our distribution into eight states. This new location will allow us to maintain our commitment to Central Pennsylvania and continue pursuing our brewing dreams in a state-of-the-art brewery with an expanded tasting room to give our customers an even greater beer experience." "Hershey is a special place, not just for people who call it home, but for the millions who come to visit each year," said John. "We want to create an experience that compliments the other Hershey attractions, creating an even more vibrant and exciting destination for all visitors," added Chris. As part of the new facility, Tröegs Brewery will be installing a new brewhouse, fermenters and a kegging line. Once the new brewery is operational, all equipment will be moved from the Harrisburg plant to Hershey with no interruption to the beer production schedule. "Running two facilities simultaneously will create a series of challenges," said John Trogner. "But we need to continue producing beer in our current location until the new location is completely operational." The Hershey facility will provide a unique brewing experience -- featuring a 5,000 square foot tasting room with the new brewhouse as the focal point of the room. The tasting room will open onto an outdoor seating area. "Visitors in our tasting room will be sitting literally in the middle of the brewhouse, said Chris Trogner. “They will be able to watch our brewers in action." When designing the concept for the new brewery, the goal was to make a customer really feel like they are a part of the brewing process. Visitors will be able to watch the brewers in action and take a self-guided tour down a window-lined hallway through the heart of the brewery. The smell of barley and hops will fill the air as the customer gets a glimpse at the fermentation process, packaging room and oak barrel-aging room, and lab. One exciting addition to the layout is the pilot brewing room where experimentation takes place and their famous Scratch beer series is dreamt-up and made. Tröegs will also continue to provide guided tours of the brewhouse on designated days. "John and I have visited a lot of breweries over the years and we want to create an interactive facility where our customer really gets an understanding of what goes into making quality beer, Chris noted. “We want to showcase what we do best."